We have 4 bottles in stock now! Evocative of a Bernini sculpture, this vibrant Champagne is equally about the statuesque frame of acidity and chalky underpinning as it is the finely honed details, including the silken texture, the aromas of lime blossom, saffron and incense, and the expressive, woven range of crème de cassis, ground espresso, kumquat, crystallized honey and toast point flavors. Long and focused, echoing the rich profile on the finish. Drink now through 2034. 1,129 cases made. Aromas of lemon sorbet, chalky notes and white flowers with toasted almonds, backed by a strong, stony mineral thread. Super acidity drive on the palate with a core of pure lemons and grapefruit. Long, smooth-tannin finish. This is both concentrated and elegant. A single location and single variety. Amazing quality here. Drink or hold. The 2004 Clos du Mesnil captures all the pedigree of this epic Blanc des Blancs vintage. 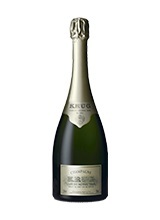 A soaring, majestic Champagne, the 2004 dazzles from the very first taste with its crystalline purity and brightness. In two tastings so far, the 2004 has been nothing less than a total showstopper. The vertical structure and pure, tightly-coiled power are the stuff dreams are made of. There is little doubt the 2004 is one of the very finest Clos du Mesnils in recent memory. Will it join the 1979, 1988 and 1996 as one of the all-time greats? Now, that is a tasting I would love to do!